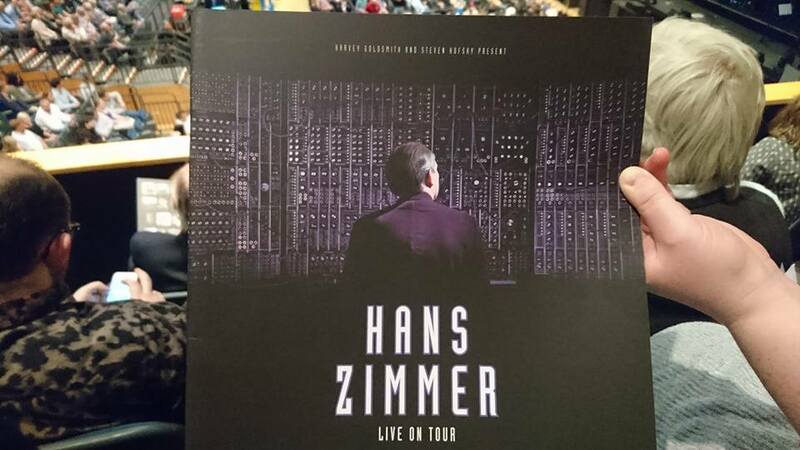 As an early 30th birthday present, my wonderfully kind sister bought tickets for us to go and see Hans Zimmer Live at the Bournemouth International Centre on 28th May. I have been a fan of Hans Zimmer’s work for some time, and was looking forward to it immensely. I was expecting an orchestral concert; Zimmer conducting an orchestra, playing his major film music works. This would have been fantastic, but what we got was so much more and so unexpected. I would go as far as to say it is the one of the best concerts I have ever seen, a spectacle of sheer genius and unrelenting talent. It all started with the theme tune from Driving Miss Daisy (1989). Hans Zimmer himself on stage with his band of musicians. The soloistic lines in the piece enabled each of the instrumentalists to introduce themselves to the audience by way of their instrument, and with every note they played I realised the calibre of the musicians in front of me. Crimson Tide (1995) was the next piece to be introduced, but I don’t think anyone in the audience was prepared for what was coming. The band began to play, but soon after, a curtain behind them was raised to reveal a huge percussion section; drums, timpani, xylophone, and right in the middle Satnam Ramgotra on kit. Focused and brilliant, the heartbeat of the concert. Oh wait, another curtain is raised behind the percussion to reveal a full orchestra of strings and brass, and a choir! There must have been well over one hundred musicians on stage, the sound was overwhelming and the audience were buzzing! The whole concert was a journey through the film music of so many major blockbuster movies. The first half of the programme featured Zimmer’s better known works. I was brought to tears by the beautiful, haunting vocals from Gladiator (2000), and wanted to stand and pump my fist in the air during Pirates of the Caribbean (2003) led by a jaw dropping electric cello solo by Tina Guo. My inner British stopped me though and I stayed sat, tapping my foot with an enormous grin on my face! We were joined by the one and only Lebo M for the Lion King (1994) THE vocalist for the original film. Instantly recognisable and such a privilege for us to hear and watch as he sang The Circle of Life, accompanied by everyone on stage. The second half of the programme was all about the action and superhero movies; The Dark Knight (2008), Man of Steel (2013), The Amazing Spider-Man 2 (2014). Gone were the well known melodies from the first half, replaced with a dark and menacing sound. Zimmer’s use of electronic instruments and sounds helped to create music that was loud and unsettling. The second half ended with Interstellar (2014), one of Zimmer’s most recent films, and I was so pleased when the musicians returned to the stage to play Inception (2010) as the encore, in my opinion one of his most accomplished works. The high pitched violin slide that ends the film (as the viewer is left to wonder whether the spinning top will topple), ended the whole concert. It was so simple, yet so dramatic. Just genius. Throughout the concert Hans Zimmer introduced his music and delighted the audience with stories of how the film and music had come about. He came across as eccentric but humble. He talked of his nerves and how unexpected the success of his tour had been. He introduced his musicians and talked with huge pride and admiration for their talent. I can only hope that Zimmer continues to write music and some day will do another tour. I will be first in line for tickets. As a musician myself, I was left mouth open at the skill displayed on stage that night. Inspirational in every way, and it has encouraged me to pick up my pencil and get back to composing music again. It occurred to me whilst sat in the concert that music is an art form that does not require support or enhancement by anything else. In the context of Hans Zimmer’s music, a film is nothing without the music, but the music can still be everything without the film.